This last week there have been flurries of articles and tweets about a subject that is near and dear to my heart. Austin's push for rail transit was the reason I started thinking about these issues and part of the reason why I started this blog. I even wrote my Master's Report (Source of some of the Timeline below) on the politics and history of this movement that has caused so much consternation to local advocates since the early 80s. I've written about these issues in Austin many times before. (Alignment, VMT Reduction, and Starter Technology Decisions) Some of you might be getting sick of my Austin posts, but ultimately the point of this blog is to bring information to the forefront and get folks to think about the decisions they are making about transit and technology. 1960s - In the 60's, as happened all over the country, major arterials in cities were slated to become freeways. While many cities built an initial freeway network and loop roads, Austin's neighborhoods pushed back on getting sliced in half and limited freeway development to two major north/south corridors and East/West corridors that were far away from the city center, making arterial streets the major corridors. Texas Freeway has historical pictures and documents. This meant that getting east to west in central Austin has to be done on surface streets. 1973 - The Texas State Legislature, understanding that regions were growing and cities alone were too small a jurisdiction to support regional transit systems, passed a law allowing Metropolitan Areas over 600k people create a Metropolitan Transportation Authority (MTA). At the time Austin did not have enough population. 1981 - Austin lobbies successfully to get State Legislature to allow cities over 325k people to get an MTA. 1983 - An interim agency named the Austin Area Rapid Transit System was created to be the predecessor to the RTA. A Transit service plan created in 1984 consisted of a short and long term plan. The short term was for increases in bus service as the long term consisted of rail planning. As part of the long term rail planning for the RTA, the agency began discussions to purchase existing freight rights of way from Southern Pacific. Additionally, there were discussions on forming a Metro Government and a bill was written by Representative Terrel Smith but never filed. 1985 - Replacing the Austin Area Rapid Transit System, Capital Metro Transportation Authority (Capital Metro) was created and given the ability to levy a cent sales tax, which was chosen instead of an emissions tax or a gas tax increase. The first day of service and the resulting bus parade down congress made a lot of locals angry, and set Capital Metro off on the wrong foot with many at the local level as well as the state. 1986-87 - Flush with cash from the cent sales tax, Representatives in the Legislature started trying to redistribute half the sales tax value that was being saved up for future rail construction. Representative Terrel Smith sought to give the half cent back to relieve property taxes in the district. 1989 - Board members voted to reduce the sales tax a quarter cent to quell criticism. While rail supporters wanted Capital Metro to keep saving for a future rail plan, others such as Travis County wanted the extra money to pay off road debts. 1990 - Funding was allocated to study rail in Austin and the board stated that a referendum would be had if they got a positive outcome from the study. A referendum was pushed back but CAMPO put rail planning in its long range plan that year. That very same year was the break out of Austin's growing environmental movement. Tired of seeing developers ravage the land above the Edwards Aquifer and its recharge zones, Austinites came out in droves to an all night meeting that saw the end of a single Barton Creek Planned Unit Development, but a start to the environmental machine in Austin politics. 1995 - Planning for a rail line, the board decided to raise the sales tax back up to a cent, which drew criticism from enemies still existing including Gerald Daugherty. Even though an overwhelming amount of the speakers at the meeting spoke on behalf of the increase, the Austin American Statesman and others criticized the board for not having a referendum in place for rail before making the vote. The general manager even decided to leave when the Statesman kept going after the agency. 1997 - Because of accountability issues stemming initially from the board vote on the tax increase, the Legislature decided to restructure Capital Metro's board. This would not be the only time the board structure would be changed. Instead of a citizen board, it would be populated by elected officials, who would be seen as more accountable to the public. Additionally, Representative Sherri Greenburg passed a bill in the legislature that would require a referendum before the agency would be allowed to issue debt. At the same time, planning for a commuter rail line that looks like the current one would be studied, as well as others that look a little familiar. 1998 - With a restructured board and possible bills that would strip Capital Metro of its cent sales tax coming at an even faster pace, rail was considered again and consultants came up with the idea for the Green Line, which would go directly through the heart of Austin. The line was supported more than the Red Line, which would circumvent major destinations downtown but would be cheaper due to its route on existing rights of way. It was at this point that Capital Metro started officially stashing away money to pay for future rail construction. 1999 - Capital Metro promised legislators who continued to write bills to take funding away from the agency that they would have a referendum in 2000. Representative Mike Krusee from Round Rock and others including Representative Terry Keel continued to hammer the agency and push bills that would take away funding authority. Krusee's bill would require a referendum on half of the sales tax, essentially stripping Capital Metro of its ability to save money for rail plans. This was also the year that Austin Bergstrom Airport was completed and the Mueller Airport, a few miles outside of downtown on the east side was left open for redevelopment. Planning included future stops on a yet to be named rail line. 2000 - The decision was made to have the referendum during the 2000 presidential election, in which Texas' Governor George W. Bush was on the Presidential ballot. 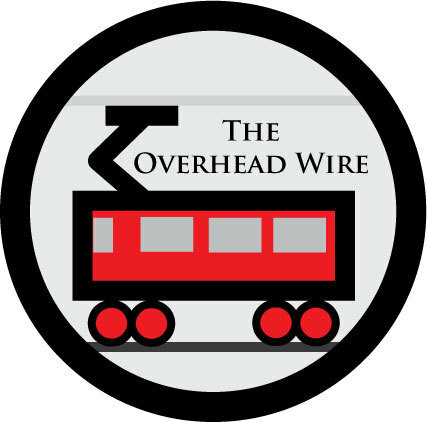 The hard fought contest brought out the anti-rail groups in droves, with Texas getting special visits from Wendell Cox and others to push for the rail line's failure with the hope that the extra money would go to roads. Kirk Watson, then Mayor even wanted to put road bonds on the ballot to satiate the Road Warriors but anti-rail leaders like Gerald Daugherty wanted rail money for roads, claiming other bond money would be insufficient. Before the election, the Federal Transit Administration gave its stamp of approval, saying other cities would be in line for New Starts funding behind Austin in the process due to the high ridership drivers. 2025 estimates put the ridership estimate at 37,400 riders (17,000 new). Consequently, some lines from that FTA PE class (no pun intended) have gone on to be super successful, including Minneapolis' Hiawatha Line, Cleveland's Euclid BRT Line, Denver's T-Rex Line, Houston's Main Street Line, Portland's Interstate Max, and Seattle's Central Link. But even after choosing the correct route and a majority of City of Austin residents voting for the line, the Capital Metro service area voted against the proposal. The rail vote lost by less than 2,000 votes in a Presidential Election which had over 300,000 voters. By that time, Capital Metro had saved over $120m for rail construction. Mike Clark Madison (Who wrote many of the linked to articles above) documented the spatial approval over at the Chronicle. 2001 - After the election, to quell mounting pressure from the legislature, Capital Metro decided to rebate a quarter cent that had been saved up back to the cities for mobility projects. The agency continued to plan for light rail and a deal was brokered between Representative Krusee, who was the Chair of the Transportation Committee, and Capital Metro which resulted in a bill that would require Capital Metro to rebate the quarter cent until a referendum was passed. Additionally, Representative Krusee helped to get a bill pass that would establish Regional Mobility Authorities (RMAs) that would give locals more authority to build toll roads. 2002 - Karen Rae, who had signed on to be Capital Metro's general manager in 1998 and make the push for rail stepped down and Fred Gilliam took on those duties. Planning for light rail continued with a new name (Rapid Transit Project) however it was decided that a referendum would not be held in 2002 due to a lack of consensus for the project. 2003 - Representative Krusee, who had been named Chairman of the State Transportation Committee, had his own ideas about what the next rail plan should look like. 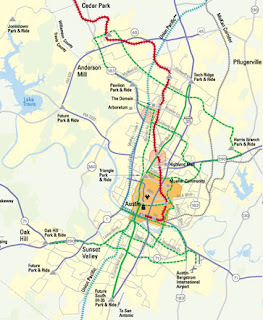 The Austin American Statesman suggested that he would like Capital Metro to stop studying the Green Line corridor and focus on the Red Line, which consultants had chosen against in planning for light rail in 1998. In 2000, the Austin American Statesman, quoted Krusee as saying "I wish they would be open to alternatives to light rail" We know now that meant planning for light rail along the best possible corridor would stop and planning for a corridor that went directly to his constituents in Round Rock (which doesn't pay into Capital Metro) would commence. At the same time, Envision Central Texas was having its coming out party as a way for the Austin region to organize itself. Unfortunately unlike Utah's process, teeth were not present. 2004 - Planning for light rail on the Guadalupe corridor stopped sometime in January. Campus planners at the University of Texas stated they stopped hearing from Capital Metro at that point. Route choices considered at the time were down San Jacinto street, on the other side of campus from Guadalupe, because UT considered San Jacinto to be the center of an expanding campus. The push for rail on the other side of campus would continue to today. Later discussions from interim CEO Doug Allen in 2009 suggested that there was not enough time to get an adequate cost estimate and firm up engineering before having the election. He also believed that the line should have been double tracked at a potential cost of $300 million per mile to build it out properly, likely to not have to worry about retrofitting the line at a future date. 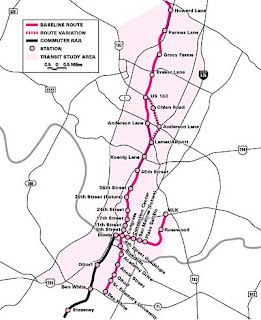 In March of 2004, Commuter Rail was announced the community and Capital Metro planned for a referendum during the Presidential election that fall. Advocates pushed for streetcar connections and other alternatives, but changes to the commuter rail plan were set by Capital Metro and planners for the agency after a few discussions were not allowed to interact with staff as they wanted to keep the line as bare bones as possible to court a winning vote. Lee Walker, then Chairman of the board, believed that going over $60m for the cost of the system would be too much for the voters and Representative Krusee hinted at the time that he would be able to get the voting requirements for extensions rescinded if the rail system was kept to just the commuter rail line. The line passed in a referendum that fall with 62% of the vote (operations began in 2010). Contrary to the previous election, neighborhood groups on South Congress and others were not as active in opposition because they wouldn't see transit construction on their streets. Also after the election, the Mueller Airport Master Development Agreement was signed, which would determine the terms of the redevelopment of the airport property that left over a large amount of empty land proximate to downtown. 2005 - The thought in the transit community was that 2004 would be the last chance to pass a rail referendum in Austin. Once the line was passed, it was believed whether right or wrong, that it could be fixed with extensions and additions such as streetcars. Capital Metro went on to study streetcars. In addition the the commuter line which was the center piece of the 2004 election, the All Systems Go plan also included BRT corridors and enhancements. Planning for those corridors began in earnest as well. 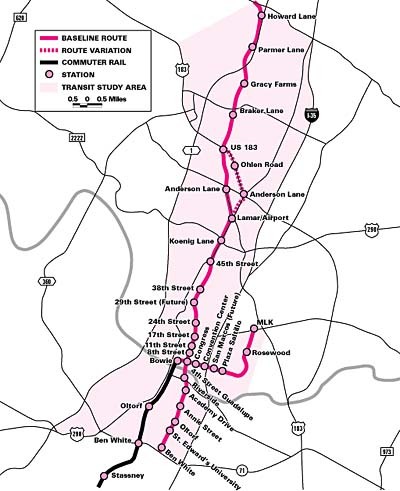 2006 - Streetcar planning continued and a route was chosen through an alternatives analysis. Pushes to get the Mueller redevelopment into the mix created a route the connected downtown with the east side of the state capital full of parking garages, the University down San Jacinto street through the stadium complex and out towards Mueller. As for Rapid Bus, some finally started to take note that getting the FTA to buy new buses and shelters without giving the line a dedicated lane was not really rapid. Council Members Brewster McCracken and Lee Leffingwell pushed back on the idea and asked the agency more questions. 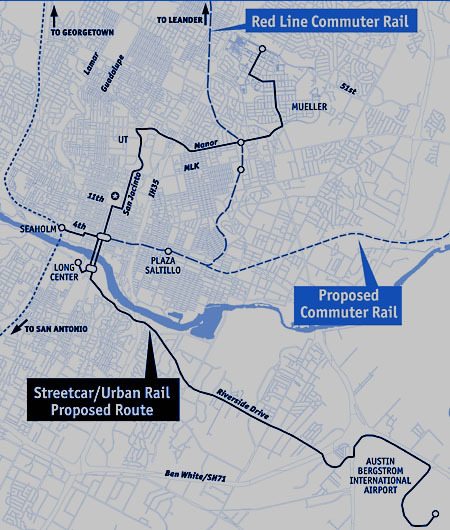 2007-08 - CAMPO, the regional MPO for the Austin area decided to take major rail planning away from Capital Metro for the time by creating the transit working group (TWG). The 15 member group would be made up of State Representatives, State Senators, Mayor Will Wynn, advocates, the University of Texas, and other groups. This was on the heels of Wynn calling for a rail election in 2008, though as with most every other call for election in Austin's early rail history, that idea would not come to pass. 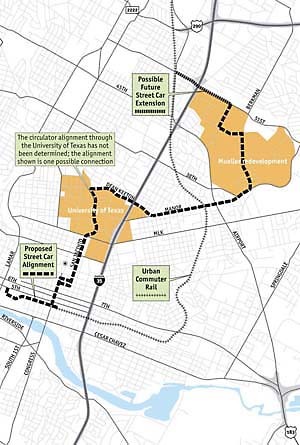 At this point the streetcar plan began its metamorphosis into the urban rail plan, with ROMA design taking up planning for alignments and continuing to push a Mueller alignment while also bringing in a Bergstrom Airport/Riverside alignment that was similar to other plans in the 1990s. ROMA was attached to this planning because of their initial task of creating the Downtown Austin Plan. 2009-10 - Planning continued on Urban Rail and more alignments were discussed but it failed to go to the ballot again due to the lack of a financial plan. Capital Metro, once rolling in cash, had drawn down its reserve to build the Red Line and thus stopped funding mobility projects with the quarter cent. (The sordid background tale is here). Also, another state audit brought more news that the agency had been mismanaged under recently retired Fred Gilliam's watch and the board was restructured again to include someone with financial experience. At this same time, Capital Metro did its first ever look at all the routes in the bus system calling it service plan 2020. Ridership along the 1 route continued to outpace all others with over 17,000 including the 101 that will soon be replaced by 'Rapid Bus'. That is more than double the next highest ridership non UT line (7). The long awaited Red Line would open in 2010 to service just under 1,000 riders. 2011-2012 - And here we are. Still planning for urban rail and still trying to figure out how to pay for it. The TWG continues to look at different corridors while the city focuses on Urban Rail. In February, Todd Hemingson laid out the process at the TWG for planning future corridors but still not much mention of the most congested and highest ranking ridership corridor in the region. Ok, so, I apologize in advance if I missed something about the history above. It's totally possible (I know there must be something missing) that I did considering the number of years and number of times rail has been close to being on the ballot, new alignments were drawn out etc. But here is what we hopefully learned. 2. Capital Metro has always been a target of regional and state ire, whether coming from state representatives who thought they had too much money, from Austin when it didn't have the money anymore, and from the Statesman, who ever since the sales tax increase in the mid-90's has hacked away at the agency, sometimes because of mismanagement, and others because of reporters that don't know the difference between a catenary and a pantograph . 3. Mike Krusee was a genius. He was able to get rail service for his constituents in Round Rock without making them pay for it. As for alignment histories, take a look at the maps below. All of these plans below are from the Austin Chronicle's archives. 1995 No map. But a discussion of the Current Red Line and "Rapid Fire" buses that would bring people to the places they couldn't get. 2000 Regional Plan - Consultants Deemed Green Line Most Bang for Buck and the Feds confirmed that point. I would emphasize that the original Red Line proposal circa 1997 was for two tracks, electric trains, lots of stations, i.e. light rail in the Red Line alignment - or, what people are now saying will make ridership on the current Red Line go through the roof. In '97, the Feds laughed Cap Metro out of the room - saying "why on earth would you build this away from the major attractors? You won't get any money from us". Nothing has really changed since then - but Cap Metro and their apologists are trying to get away with dumping more money down the Red Line hole nonetheless.